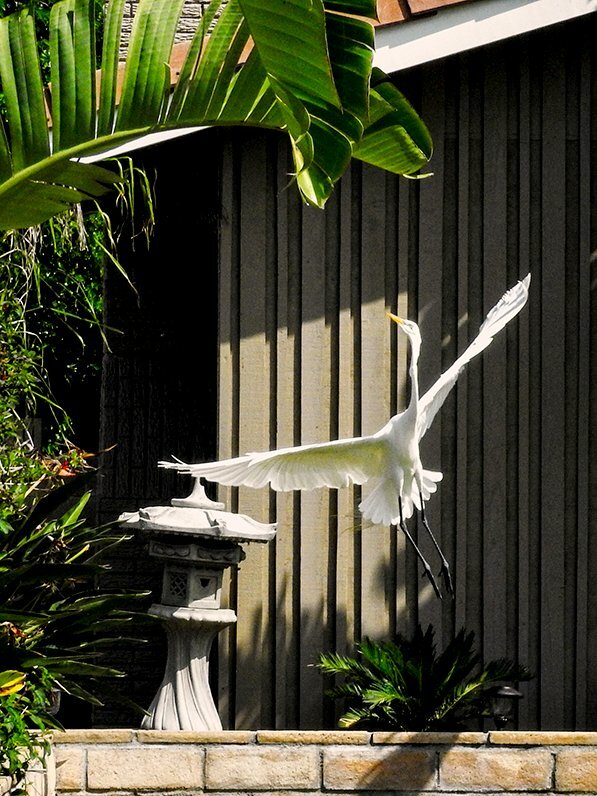 And there goes the egret with a Lizard-Lump in his throat... I thought the bird looked a part of a natural setting with that pagoda in the yard. Wait a minute; is it real or a statue? This is certainly a remarkable image. @allie912 Thanks Allie...Real! I walked around the cul-de-sac this morning, following him yard to yard. I finally just had enough photos and went back home! Not sure where he ended up! Wow! Perfect timing! A nice shot and an exciting afternoon! My husband did find two lizard tails in our garage. Maybe Katniss does more than sleep on the hood of my car when she naps there?!? He does look very much at home! What a super shot. Great timing for this.. How can these guys, with such skinny necks eat something that large. We'd choke to death if we tried it. I made our train reservations for the 18th today.... Yawn! Leave Oceanside at 7:57. See you on the train! Wonderful action captured here! That lump in his neck makes me want to keep swallowing! Fabulous bird to see in your gardens! Fav! Are you beginning to make plans to return to Nova Scotia. Love watching your stays at both places - gives them a nice variety. Perfect in every way, love the light and shadows. Love this, big fav, lizard lump and all. Yes, his form goes well with the pagoda. It`s fly likes an Angel flies . Great shot of this beautiful bird. @pyrrhula Thanks, Ferry, I did like his form I was able to capture...I thought it to be very graceful!